Well, it’s the day of the Wedding. 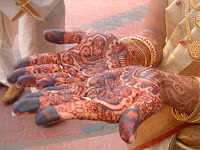 Look at her hands – those beautiful designs will remain for a long, long time, you can be sure. 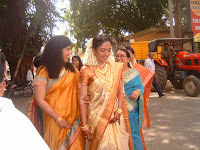 Last few comforting words (does today’s bride need those?) 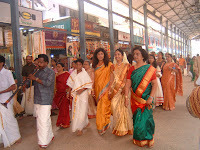 from her sister and the bride moves on… towards the kalyana mandapam outside the main shrine. 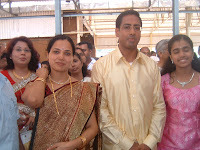 Outside the mandapam where the wedding ceremony will take place, the groom and his sisters wait.